Ocean Sunfish (Mola mola) | Better Know a Fish! Several years ago, I had the fortune to ride along with sea otter researchers off the coast of Big Sur, California, in the United States. 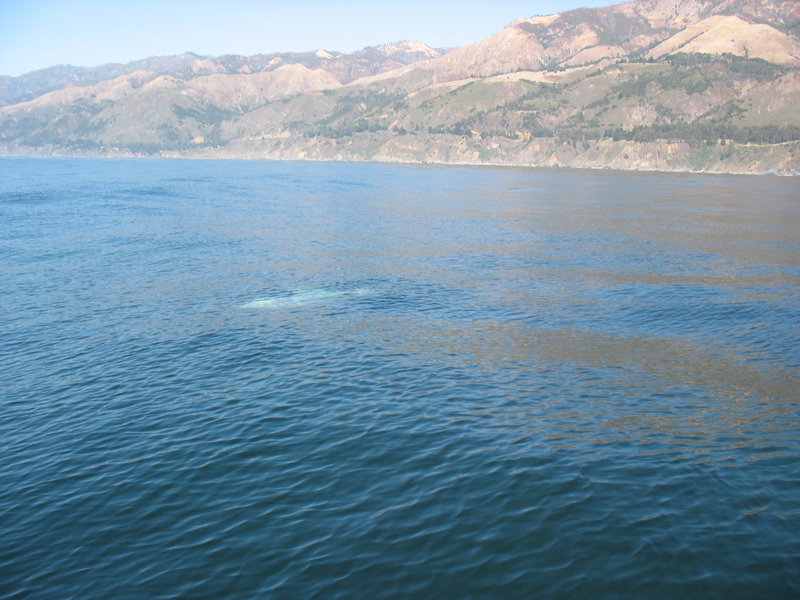 As we cruised the coastal waters to prepare for sea otter captures, we noticed an enormous, pale shape floating near the ocean surface. As you can see in the photo above, even with the wide expanse of the deep blue sea, this object was hard to miss. 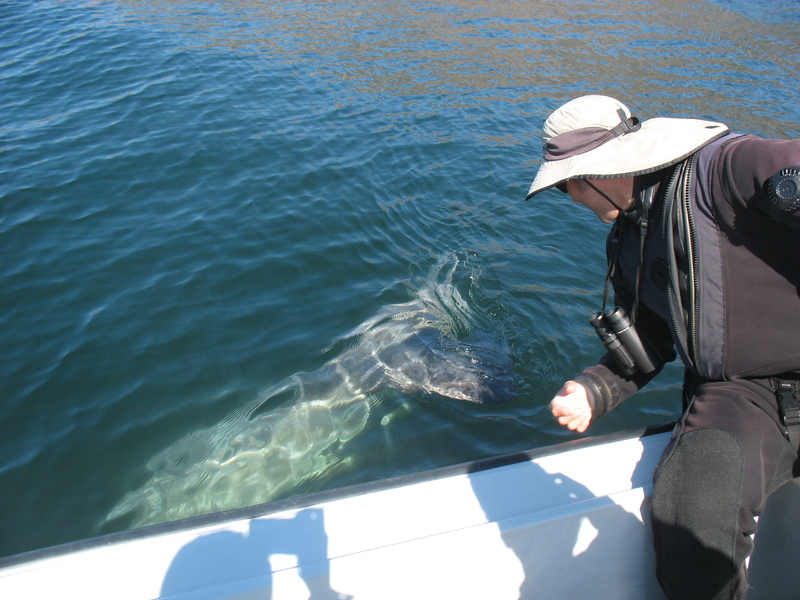 “It’s gotta be a sunfish,” one of the biologists said. Indeed it was. The ocean sunfish, or mola (Mola mola) is a giant among fishes. A relative of puffers, it is considered the heaviest of the bony fishes, with one Japanese specimen weighing in at 5,071 pounds (2.3 metric tons) and measuring 8.9 feet (2.7 m). Ocean sunfish are most often seen when they bask and float near the water surface, drifting like a large plastic bag in the water. Given this sloth-like behavior, and its great size and odd fin arrangements, people assume molas are typically inactive creatures. For some reason, ocean sunfish are often afflicted with external parasites — many gruesomely dug into the sunfish’s skin, with some trailing like streamers on bicycle handlebars. But elsewhere, molas rise to the surface and call in “air support”. Somehow, molas have learned to present themselves to seabirds — shearwater, gulls and albatross — lining up in schools of 50-plus individuals, awaiting seabirds to land on the sea surface, peek their heads below the water, and pluck and pull away at the molas’ parasites with their sharp beaks (Abe et al. 2012). Thanks to marine science educator Terri Kirby-Hathaway for suggesting the giant mola as a blogpost. 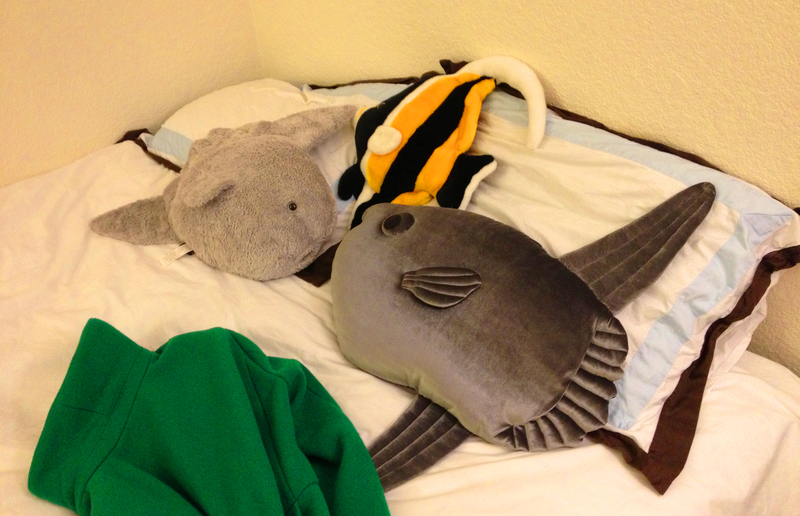 And thanks to Dr. Joanna Chin for showing off her delightful mola pillows. This entry was posted in Actinopterygii, Marine Fish, Random Fish Videos Set to Crazy Soundtracks, Tetradontiformes and tagged Atlantic Ocean, giant mola, Indian Ocean, Mediterranean, Mola, Mola mola, molas, Molidae, ocean sunfish, Pacific Ocean, parasites, pillows, seabirds, symbiosis, Tetraodontiformes. Bookmark the permalink. Isn’t it fabulous? You should search for mola larvae pictures on Google, Marjie… that’ll blow your mind even more! This is my favorite animal!